Joe is a powerful tool that lets your customers order and pay ahead when they don’t have time to wait. But to really work, your customers have to know about it! To help get the word out, joe provides window clings, counter mats and will provide cards that you can hand out to customers. Heck, right now we’re even paying up to $6 off every new order on the app! A clear, eye-catching photo that tells the story “hey, we have something new!” Showcasing your great product and logo with the joe brand is a formula that we’ve seen work time and again. 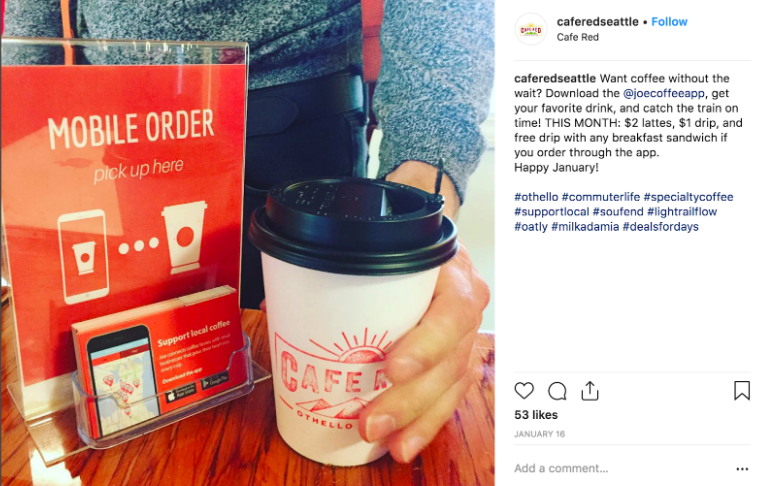 Include hashtags that include your neighborhood, city, and coffee themed to get more eyeballs on your business. Shoot for 5-10 hashtags if you can muster it. The right caption will tell people why they should order (e.g. “joe is offering up to $6 off your first order!”) and ALWAYS includes a link to our website so they can download the app on iPhone or Android (https://joe.coffee). A picture is worth a thousand words, but that caption sure helps too. Cafe Red incorporates some signage next to their product to tell a story as part of an exclusive offer they ran on joe. A great caption tells the “why” behind the photo it accompanies. Here is a standard post that works great on Instagram and Facebook! Not yet on joe? Sign up now and offer the deal to your customers for a limited time only.